I will be splitting the highlighters up into 3 segments based on their prices. Laura Mercier Matte Radiance Baked Highlight is the most beautiful natural looking champagne highlight ever that still gives you a gorgeous glow. Mac Soft and Gentle is a peachy light bronze with a little glitter. Becca Opal is a bronzey champagne shade. I love mixing this with a lighter highlight as this look a bit dark on my fair skin. Charlotte Tilbury Filmstar Bronze and Glow is one of my favourite makeup items. 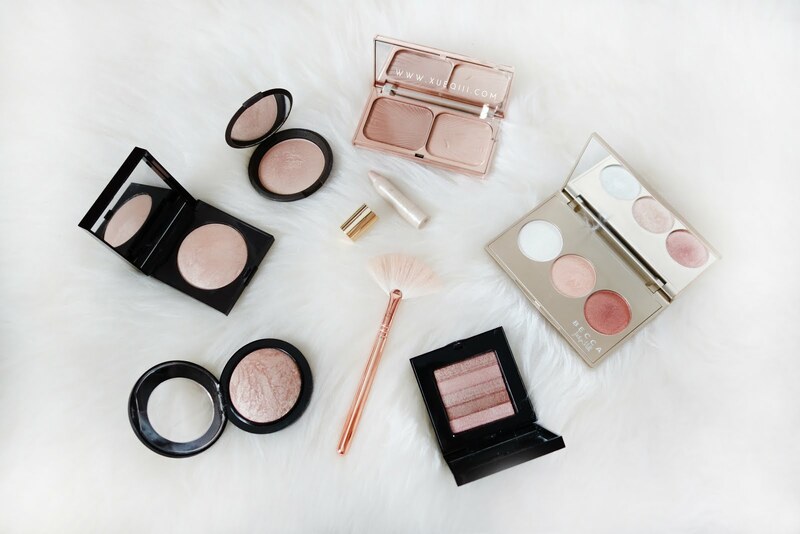 The highlight in this is extremely natural and gives you a glow from within look. Similar to the Laura Mercier highlight. Tarte Sculptor highlight has a pearly champagne finish. Very flattering on fair to medium skin tone and blends very easily. 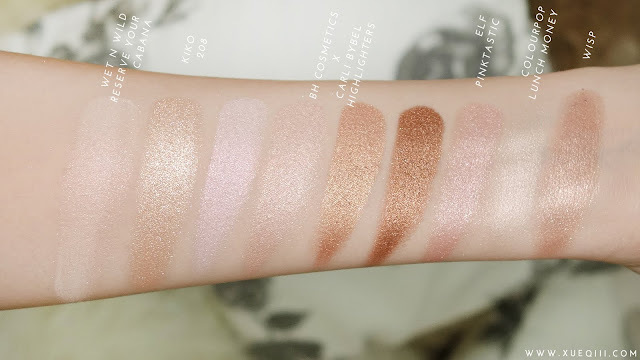 Becca Champagne Glow Palette is a limited edition holiday set but most of the shades are available individually. 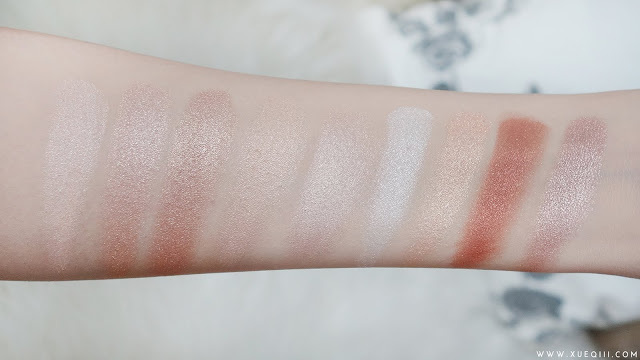 Pearl is a white pearly highlight perfect for pale skin girls. 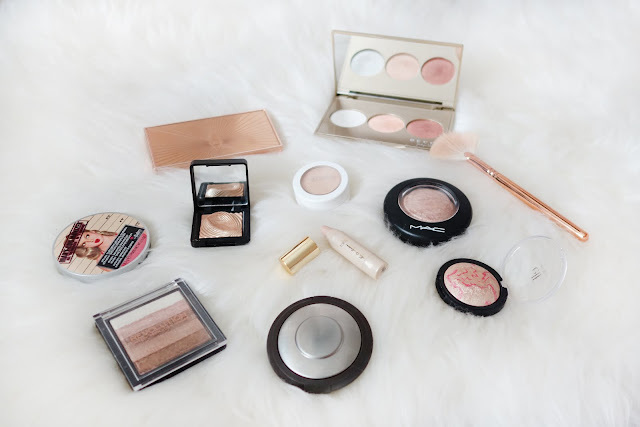 Champagne Pop is a peachy gold that looks good pretty much on everyone. I like it best mixed with Pearl. Blushed Copper is a warm copper bronze highlight for deep skin tones or as a blush topper. I never use this as it is way too dark even as a blush so I only occasionally use this as eyeshadow. Bobbi Brown Pink Quartz is a pinky brown highlight. This is too dark for me but you can use the strips individually for a lighter highlight and even as eyeshadow and blush topper. The Balm Mary Lou Manizer is a pale golden highlight that flatters fair to medium skin tones. It can be powdery at times but it applies beautifully with a fan brush. 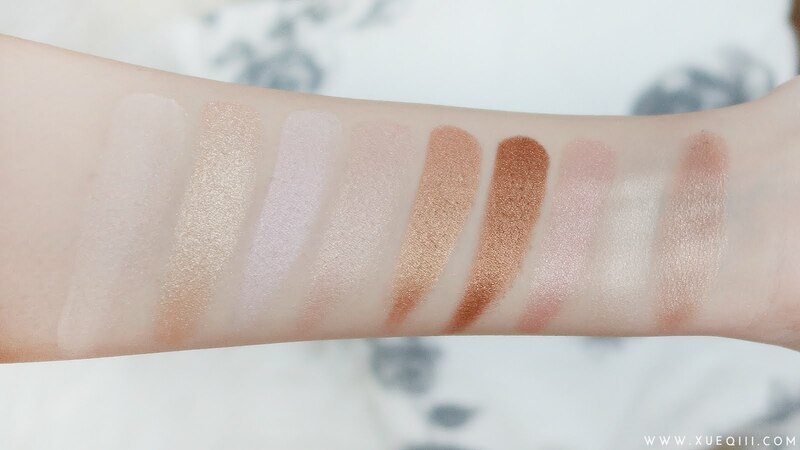 Zoeva Rose Golden Blush Palette Highlight is a white pearly shade with pale gold shimmers. This is very soft but a bit too white for my taste and very powdery. The Balm Cindy Lou Manizer is a light pink and with hint of peach. I don't see how this will work as a highlight but this is a great blush topper. Ofra x DupeThat You Dew You is a peachy champagne that has a duo-chrome like finish. 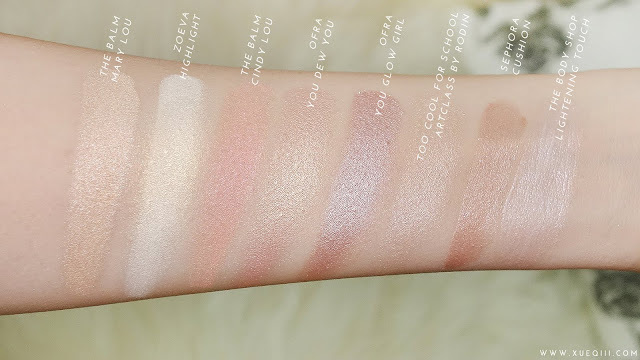 Ofra x DupeThat You Glow Girl is a lilac pink highlight that is super duper pigmented. 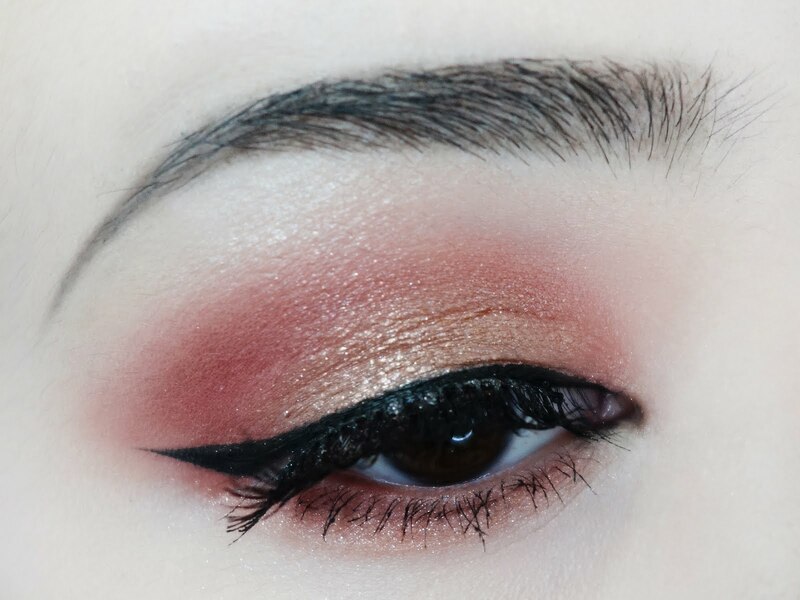 I love using this if I am going for a very intense highlighted look. Too Cool For School Art Class By Rodin has a pretty champagne sheen when all 3 shades are mixed together. Very pretty on the cheekbones, another good-old everyday highlight. Sephora Wonderful Cushion Luminizer is a deeper champagne shade with a touch of bronze that looks like a lighter version of Opal. 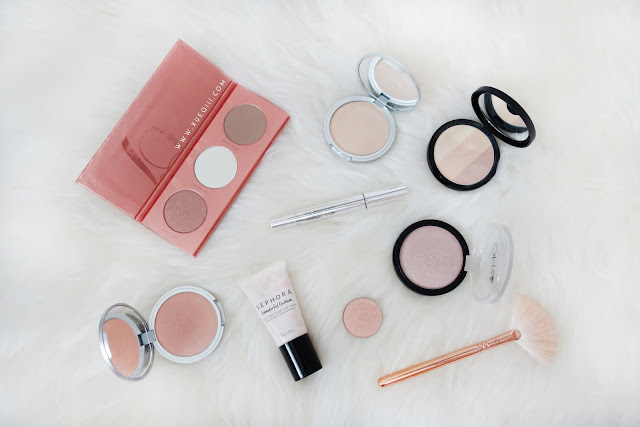 I like using this when I am wearing minimal makeup to just give my face a touch of glow without being too over the top. The Body Shop Lightening Touch is a sheer pearly highlighting pen that can be used to brighten your under eye and also a natural looking highlight on the cheekbones. Wet n Wild Reserve Your Cabana is suppose to be a bronzer but I seriously do not see this working as a bronzer for anyone. It has a very slight sheen to it. Instead of using it as a regular highlighter, I have been loving this as an all-over glow face powder. I use a fluffy face brush to dust this around my face. Kiko Water Eyeshadow 208 is a popular dupe for the Mac Whisper of Guilt and Oh Darling. This is one of my favourites because of the longevity. Even at the end of a humid and sweaty day, the highlight still stays on and looks amazing. It is a gorgeous champagne gold. 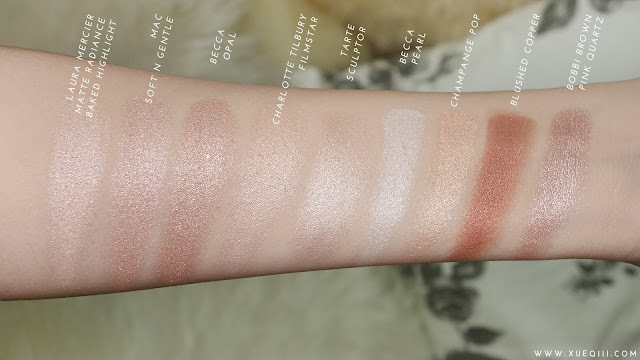 BH Cosmetics x Carli Bybel Palette Highlighters are amazing. The 2 lighter shades looks pretty mixed together and the 2 darker bronze are so intense and pigmented. I love them as eyeshadows! Elf Pinktastic is a baked blush that has pink and champagne swirled together. This has got to be the best affordable highlighter out there. Amazing formula and lasts a long time on the cheeks as well. Colourpop Lunch Money is a soft light gold with a creamy formula. This doesn't layer well on top of powder so be sure to apply this before setting and I like using a fan brush to do so. Colourpop Wisp is a golden champagne highlight. Too dark for me but will look great on medium to deeper skin tones. 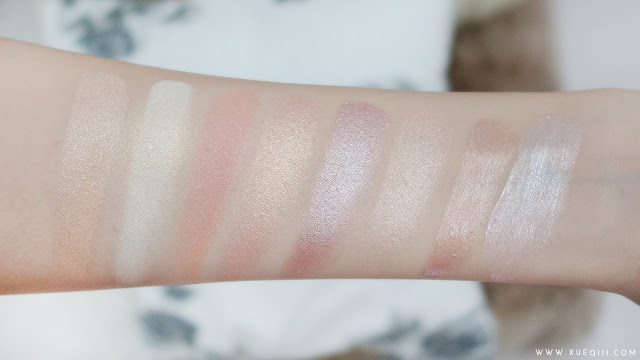 Similar to Becca Opal. Makeup Revolution Iconic Pro Trio Highlighter (Flush) is a super pretty light champagne that gives a very nice sheen. Not chunky or glittery at all. Makeup Revolution Radiance Palette is a popular dupe for the Hourglass Ambient Lighting Powders. I have only swatched the Hourglass ones in store but I really have to agree that these are very very similar. The texture is almost identical, these are maybe a touch more shimmery and Hourglass is more powdery. Breathe is a skin tone shade for all over the face glow. Exhale is a pearly light pink sheen for highlighting on the high points of your face. Glow is a bronzey gold shade for bronzing up your face - especially pretty as a bronzer topper. Wet n Wild Boozy Brunch aka Hollywood Boulevard is another popular dupe for Mac Whisper of Guilt, Estee Lauder Heat Wave, Laura Geller Gilded Honey. This is slightly darker than expected but still a super intense golden highlight. Physicians Formula Miami Strip is a warm deep champagne highlight. The powder is a bit hard so it will need some warming up. 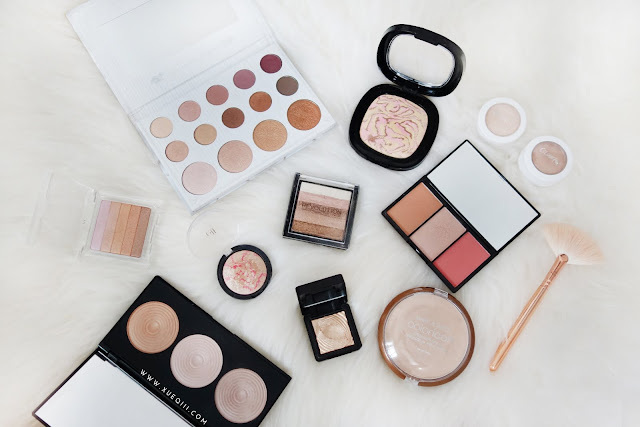 For fair skin girls, you can use the top 2 strips for highlight and the rest for eyeshadows or bronzing. 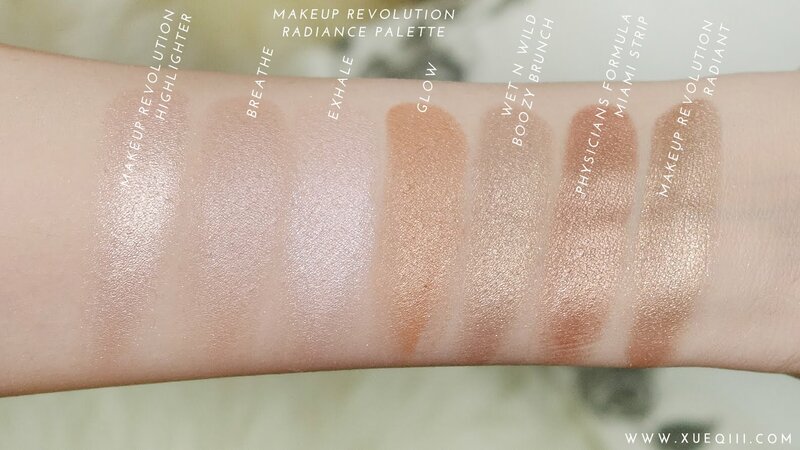 Makeup Revolution Vivid Shimmer Brick in Radiant is a bronzey highlight. Like all shimmer bricks, I can only use the top 2 lighter strips for highlight. I have done an entire eye look using just this and it looks so amazing and pigmented on the lids. Very impressed, especially when this is so cheap! These are the brushes I have been liking to apply my highlight. Zoeva 114 Luxe Face Focus applies highlight more diffused like the fluffier Morphe M510. Morphe M501 gives me a slightly more intense highlight as it picks up more product than the rest. 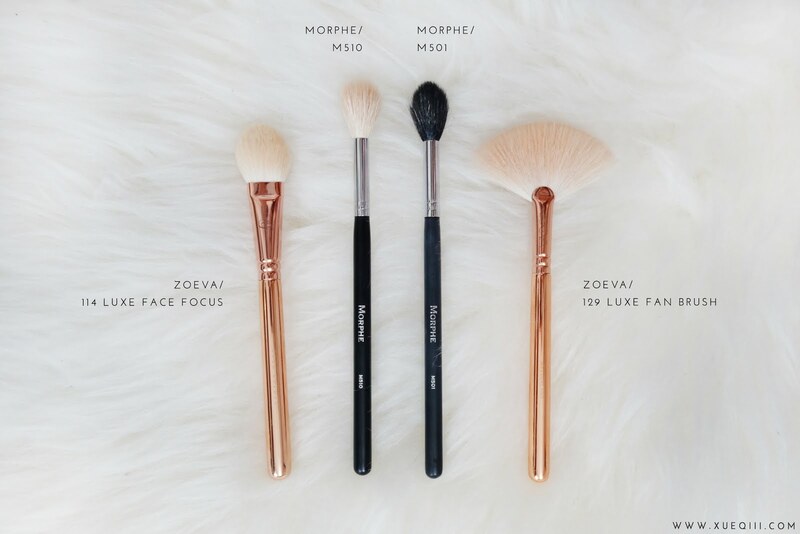 The Zoeva 129 Luxe Fan Brush has been my go-to highlighting brush recently as it is so easy to use and gets the job done very fast. Picks up just the right amount of product. Missed out another one which is the Real Techniques Setting Brush. I want everything! Is that even possible? Holy cow! I thought I have a lot of highlighters but hell no where near your collection! LOL! I need to check Wet n Wild Cabana, how come I've never heard about it before? 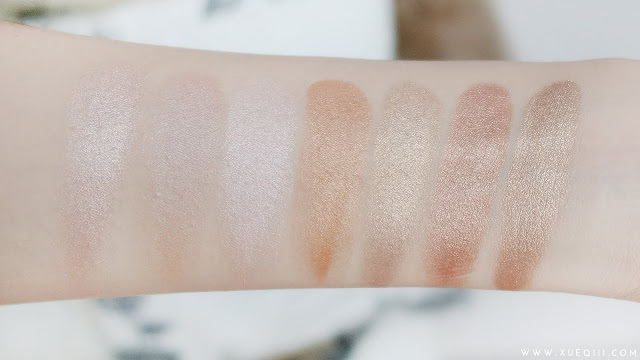 Becca Opal looks gorgeous, though I'm dying to try Champagne Pop! 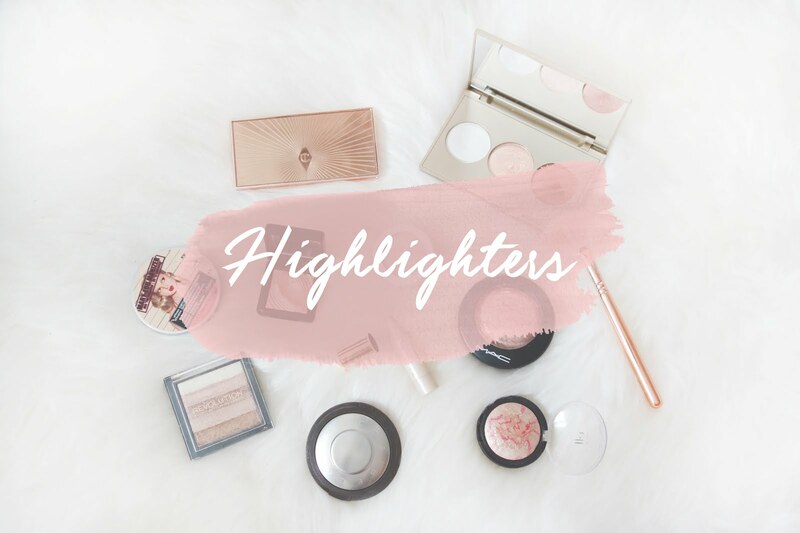 I'm so jealous of your highlighter collection, you can never have too many!